Panang Curry (sometimes written Penang Curry) is a dry curry which is fried in coconut milk, and not boiled. Panang uses the thicker part of the milk, or the cream only. It’s typically made with beef, although you can make it with pork or chicken as well. 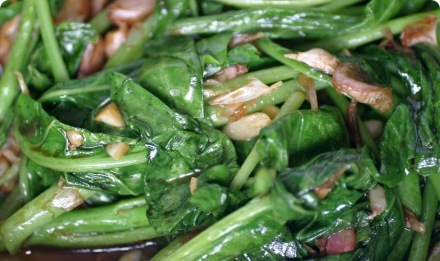 It is usually just meat, and is seasoned with sliced lime leaves and sometimes a few leaves of Thai basil. The first step is to make the curry paste. Start by soaking the chilies in water until they’re soft. This could take up to a half hour. When they’re soft, cut them open to remove the guts & seeds. Toast the cumin seeds, cilantro seeds and peanuts separately in a pan over medium heat. Roast each until fragrant, about 3-5 minutes. Grind up the seeds together in a stone mortar and pestle until powdered. Remove and set aside. Add your chilies with the salt to the stone mortar and pestle and pound until a paste. This will take awhile — the skins are difficult to mash. Be patient. When your chilies are a uniform paste, add the lemongrass. Pound until a paste. Then add the galangal and coriander roots, and again, smash until paste. Add the peanuts, shallots, garlic and your powdered cumin & cilantro seeds. Mash until paste. Add the shrimp paste and pound to mix well. Set aside. Cut your meat cross-grain into thin slices (about 1.5″ (4cm) long x 1/2″ (1.25cm) tall x 1/8″ (.25cm) thick). Now, on to frying your curry! Heat up your pan first on medium-high heat, then add 1/2 cup of the coconut cream. It should sizzle right away and boil. Add all the paste and mix well. Fry the paste. You want to keep the paste dry, but not too dry that it sticks and burns. Keep adding a little bit of coconut milk when it gets too dry, maybe about 1/4 cup every minute or two. Keep stirring so it doesn’t burn. Keep adding coconut cream about 1/4 cup at a time, every minute or two. You should start to see a lot of oil coming to the top of the curry. This is normal and a sign that you’re doing it right! Your paste should start to smell really good after 4-5 minutes. You’ll start to see a lot of oil rising to the top, especially where it’s bubbling. When it does, add your meat. Cook the meat until cooked, add the lime leaves, fish sauce and palm sugar, then keep going about 3-5 minutes so the meat is soft. The consistency of the curry should be similar to the photo. If it’s too dry, add a bit more of the coconut milk. Remove and serve. Feel free to garnish with shredded lime leaves and a few leaves of Thai basil. Some fancy restaurants serve it like shown with a bit of thickened coconut cream (thickened with a bit of tapioca flour) which you’re welcome to do too! Panang Curry should be dry and thick like this, and not soupy like red or green curries. While Panang is usually made with meat, some restaurants serve Panang with shrimp. It's up to you! If you'd like your Panang curry to be a bit hotter, try adding some :small dried chilies: in with your paste. Slicing the meat thin like this allows the meat to get soft and absorb the flavor quicker. The curry paste sounds yummy – how would it go as a vego version made with extra salt to substitute for the shrimp paste? I presume this would be too strong a flavour for tofu, but how about with potatoes, eggplant and spinach? Leave out the shrimp paste and add another 1/2 tea of salt when you make the curry paste. I’d use tofu or mock duck meat from the Chinese grocery. If using tofu, cut into 1/2″ thick x 1″ x 1″ cubes and deep fry first. Then cook as you would meat. If you get the mock duck, just throw it in — don’t pre-fry. I wouldn’t recommend adding any veggies. Try just tofu or mock duck first, so you can get a good feel of the taste of the curry paste. The paste is the king of this dish. Let me know how it turns out, and good luck! I just made this recently with firm tofu and it was wonderful. Instead of deep frying the tofu, I drained it, wrapped it in towels, and pressed out the moisture under an iron skillet for about half and hour. Then, after cutting up the tofu, I put it under the broiler on a cookie sheet lined with foil and with a light coat of cooking spray, for about 13-14 minutes, turning it once after about 7 minutes. That gave it a crispy, slightly golden exterior without having to deal with hot oil. I did add veggies, but on top of the curry, almost as a garnish: steamed red bell pepper slivers and julienned carrots, along with a few uncooked bean sprouts and Thai basil. It’s not at all too strong a flavour for tofu – we have it regularly (from a local Thai restaurant, not home-made) and one of the menu options is to replace the meat with tofu… which we do (we’re vegetarians lol). In the vegetable and tofu version they don’t use fish sauce either, and it is AWESOME. Boy, is THIS comment late to the party! (Just noticed I’m responding to someone writing in 2007… time travel much). … not very fond of coconut milk. but i will give it a go only with beef. Hi – I found this sight and just love it! I also cannot wait to try this recipe! But is it possible to use a premade curry, insead of preparing it from scratch? If so, is there a specific one you would recommend? Angi — I’m glad you like the site! Give Cosmo a big hug for me if you’re nearby will ya? Christine — It is possible to use pre-made curry paste instead of homemade. I haven’t taste tested the difference between the two big brands (mae sri and mae ploy) for Penang. I generally like mae ploy (the plastic tub) better. If you’re using this style of paste, it might help to freshen it up a bit with some crushed garlic. I don’t think they add the peanuts either, so you may want to add that when you fry it. Great site. Clean and well done. I love the slide show, very helpful. 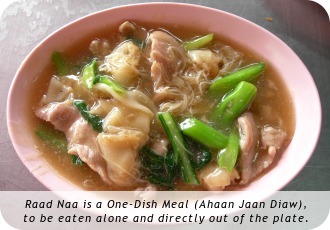 I stumbled upon this site while trying to find out more about Panang Curry. I bought a can of this from my local Asian supermarket and it turned out great. I think, I’ll try making it fresh thanks to you. Hey great website. I’m attempting to make Khang Panang for my husband. I can only find the panang curry recipe. Is this recipe what I need to use. I am confused! Kang (pronounced more like “gang” in English) is “curry” in Thai. Well, it’s any sort of soupy mixture, including soups. So, Kang Panang is Panang Curry — this recipe. Good luck, and let us know how it turns out! Hi! What a great recipe, thanks so much for posting it! I grew up on Thai food, and Panang is one of my favorites. The other day I had the most amazing Panang at a local restaurant – instead of sliced beef it seemed like they used a roast, like a chuck roast or beef shoulder. It was so good – the meat was so tender and flavorful. Do you have any idea how to go about preparing this dish with a chuck instead of sliced beef? I would love to make it at home! Thanks for this great recipe – have been looking for this a long time. Excellent! This looks like a great recipe- I’ve been searching for one. Thanks. Just a couple questions, though. Most, if not all, panang curry recipes I’ve seen use something like 1/8-1/4 cup fish sauce after frying the paste. Think that would be a good idea? Also, Thai basil- should I include some as well? I added 2 tablespoons – start with that, you may need to add another one to taste. It’s already salty from the salt+shrimp paste in the curry paste, so it’s up to you. And yes, feel free to add a bit of Thai basil at the end if you wish. The important garnish to not forget is the shredded lime leaves. Thanks for the heads up, and let me know how it turns out. I just made this for lunch! It’s my all-time favourite thai curry. must-have whenever in thailand. Now i can make it at home! didn’t make the paste though, i bought instant ones off the shelf. Hi, i tried this recipe a while ago and it worked really well. I’m having some friends around in a few weeks and plan to cook this as a main course, any ideas what would go well as a starter? Thais don’t eat the same way that Westerners eat (starter, main, dessert, etc). All the dishes are just out on the table and everyone eats from the center. See the “How to Eat Like a Thai” article on our site. That aside, if you wish to eat Western Style, I recommend perhaps one dish from the “Snacks and Street Food” section of the site, and perhaps a “Yum Thai Salad” too. And don’t forget the rice! Hi, Love the site. Just a quick silly question though, for the panang recipe, how many people does this make for? Hi. Lovely site with all the details. I want to try this curry and other dishes, but where I live in Indonesia I can only get coriander seeds, not the leaves and roots. Will I still be able to cook authentic Thai? Sometimes I cheat with the ubiquitous lemon basil, but I know its not the same. Can I substitute something or just leave out the coriander? Thanks a bunch. This recipe will feed about 2-4 people with rice. I recommend cooking another dish or two to balance it, as curries are quite heavy. Perhaps a tom yum and a fried veggie dish. Indonesia doesn’t have coriander/cilantro? That can’t be right. Perhaps you are confusing the plant? It’s called ‘Ketumbar’ in Indonesian, if that helps. It’s got to be common there – there hasn’t been a country in Asia I’ve been to yet which didn’t have it. Especially SE Asia. Hi, I hope you were looking for the number seven, didn’t quite understand what that meant. OK, on to the Panang Curry. I’ve been successful in growing lemon grass (lots of it) and Thai basil. Now I need to know how to use it for making the Panang. I live not to far from the large Asian Market, Super H, but it’s mostly Korean and lately I’ve not been able to find the small cans of curry paste. I picked a small jar of Instant Red Curry paste so I’m going to see how it works out. Also, I picked up a 1.1 lbs. plastic container of Red Pepper Paste (Taeyahgcho Gochujang) it’s Korean and I probably won’t want that in my curry. What are your thoughts? I live in an Atlanta suburb, there’s lots of Vietnamese and Koreans but apparently not many Thais. I’ve run all over town trying to find panang curry paste with no success. Can’t find Kifir lime leaves, is ordering them on-line a good option or do they come all dried out? Maybe I should try to grow that too. I love your site but even more….I love Thai food. Thanks for a wonderful web-site. A correction and clarification: it’s the panang curry paste I can’t find. Also know that should have been “too” far from a large Asian Market. Didn’t want to sound like a dummy. This dish looks so beautiful. I’ve been experimenting with curry recently, and I’m going to try to replicate this. I live in Chicago in an area with a high concentration of Thai restaraunts (Lincoln Square), and there is even a little Thai grocery store just a block or so from my house. Maybe in a year or two my knowlege of Thai cooking will be through the rough. hey cait. i’m planning on making the panang curry your mom brought back. do i need to add fish sauce and palm sugar or is it already incorporated? your site looks DELICIOUS, will definitely be back for more. hope all is well with you. miss ya! The curry paste does not have the fish sauce or palm sugar – just the ingredients listed inside the “curry paste” box. So start with step #7 since you already have the curry paste made for you. And in the ingredients section, ignore the “curry paste” box and just get the lime leaves, fish sauce, coconut milk, etc. If you’re not going to make it within the next two weeks, keep the paste in the freezer. Enjoy! This looks so right! Plan to make a big batch of the paste and freeze some. One question — what kind of beef do you use? Top round seems to get tough even when thinly sliced. Chuck would take a long time to soften up, wouldn’t it? Great site, great recipe description, great photos! I just tried to make the recipe, but with fresh red chiles instead of dried. In the end, the paste ended a bit weak, and didn’t allow for too much coconut milk (without tasting bland)so it was really thick. Does using dry/fresh chiles make a big difference?? How many dried chiles do you use (hard to measure 1/3 c) How many fresh?? thanks! I use about 10 dried chilies in this recipe – you can see them in the teeny picture of all the ingredients before they’re mashed up. I don’t use fresh – only dried. If your curry was too bland, perhaps you were using canned coconut milk? That is very thick, much thicker than fresh. I think if you tried diluting it with water next time (ie: not using so much coconut milk) it would be stronger flavored. If I used canned, I tend to use about 1/2 can for a pot which serves 2-3. How many does this serve?>! all of our recipes on this site make about one Thai serving dish size… so enough for one or two people with rice. Your recipe looks great, I am planning to make it for my fiancee’s bday dinner, we both love panang curry. What’s the serving size of the sauce?…we tend to like extra. I’m excited to try it out! I’ve fallen in love with Thai food all of a sudden and made red curry for the first time the other day and it turned out great. However, panang curry is my favorite! but I’ve run into a problem… I can’t find lime leaves anywhere! Can you recommend a substitute or somewhere I can find lime leaves? There’s no substitute for lime leaves! If you can’t find them locally, you can order them online. They freeze well. Sorry, this response is just about a year too late, but I hope you still look at this page from time to time. I recently had amazing panang braised short ribs at Nan restaurant in Atlanta and have been itching to reconstruct the dish ever since. Tomorrow is the day! I’ve been working with coconut milk a lot lately, particularly in my slow cooker, and I’ve found that I have no problems with separation as long as I don’t let it get hotter than a gentle simmer. Also, just for convenience’s sake, this time I’m going to use a storebought spice paste–I have a tin each of Maesri and Mae Ploy’s version, and I’ll just do a taste test to choose. My plan is to first pan sear the short ribs (salted) in chili-lemongrass oil that I’ll whip up. Then, in the same pan, I’ll fry the spice paste in the coconut milk as described in this recipe, adding the fish sauce, lime leaves, and palm sugar once it’s cooled. I will add the curry to the ribs and then throw it all in the slow cooker, set on low. I think this will turn out just right. Since I love fish sauce, I’ll add another dash just before I take the meat out of the cooker. And I’ll squeeze some lime juice over them once they’re off the heat, just to give them a cool, sour edge, and serve them with thai basil, plain white rice, flatbreads (I buy frozen parathas at the South Asian grocer–they’re pretty much exactly the same as roti canai), and chilled ahjaad–an absolutely delightful and simple cucmber salad. As far as coconut is concerned, coconut milk is about twice as dilute as cream. Since my curry is going to have tons of time to reduce (leaving the lid off the cooker for the last hour of cooking is unkosher, but it works for me) I’m not going to mess with cream. Try the Buford Farmers Market right at the intersection of 85 N and 285. They have everything! Whipping up some chili lemongrass oil sounds like something I’ve been seeking for years. Somewhere along the line, I acquired a bottle of Star of Siam Thai Oil comprised of Roasted Peanut Oil, Aromatic Lemongrass, Ginger, Garlic, & Chili Oils. The bottle even gave the name “Golden Whisk”, with a Nob Hill-San Francisco, CA P.O. Box, but I have never been able to raise them, even though I managed to find a phone number for them on the Internet… they never called me back. Sooo, I would really like to find something that approximates this oil. I liked to heat a small amount over med-high heat and lightly toast a couple of slices of bread before making a variety of sandwiches. It was very versatile and my attempts to infuse oils simply fail to come close enough to pursue my independent attempts to replicate it. Any help you might provide would be great! I’ve been looking for the Star of Siam Thai Oil as well. I second your request for help in finding something that approximates it! I just finished my Panang Braised Short Ribs and they were *fabulous*. I made them exactly as I described above, using the Maesri brand curry paste–I found its flavor to be far superior to Mae Ploy’s. The only thing I hadn’t anticipated in making this dish was that the fat from the beef would dissolve and form a thick layer over the curry as it cooked (duh). I simply removed the meat with tongs when it was ready, and then passed the gavy through a fat separator. I also added a little more coconut milk to the curry to soften it–the flavor was a little too concentrated right out of the pot. Then I poured it back over the meat, warmed it all in the oven until the rest of the meal was ready, and voila! Homecooked and better than any restaurant. I have traveled several times to the border of Thailand and Burma, and have eaten the most amazing panang at a restaurant called Aiya’s in Mae Sot. No panang has ever compared to the quality of ingredients and the taste of the freshly made panang from Aiya’s. Every time I visit a Thai restaurant in the United States, from Hawaii to New York (I live in Los Angeles), my heart says, “Try the panang,” while my mind says, “try something else.” I inevitably try the panang with the faint hope that someone will make it fresh and as delicious as Aiya’s. I am always disappointed however, as most make their curry from pre-made paste from a tub – even in Thai Town! Having taken such a long time already, I’ll get to my point. Your recipe hit it almost dead on. The taste, texture, aroma, all come so close to Aiya’s. I’ve now made your recipe twice, and am so amazed! Congratulations. I owe you a prize, but until that prize comes, I promise to try out your other recipes, one by one. I’m so excited you like our recipe. I’m picky about panang curry as well, and we spent a lot of time making sure this recipe tastes exactly like the penang which we consider best… I’m glad our work is appreciated! Can you double the recipe and it turn out the same? I’m excited to try this but want to make sure I will have enough to serve! Yes, feel free to double the recipe. The recipe ingredients list says coconut milk, but in the body of the recipe you call it coconut cream. Which is better to use? No worries! You put it in at the end, around the same time you add the palm sugar and lime leaves. Enjoy! This recipe uses both. Essentially coconut cream is the fat which rises to the top of the fresh coconut milk. You start with the cream due to it’s higher fat content, and as it dries out keep adding the milk so it doesn’t burn. If you’re using canned, don’t shake the can and skim the cream off the top to start. Hi, great site and recipes. When ever I made red curries or panang I don’t get the redness, it goes brown. Any ideas as I love it when the colour is correct. Are your chilies red in color when you start? Is the paste red before frying? Perhaps you’re overcooking the paste when you fry it? 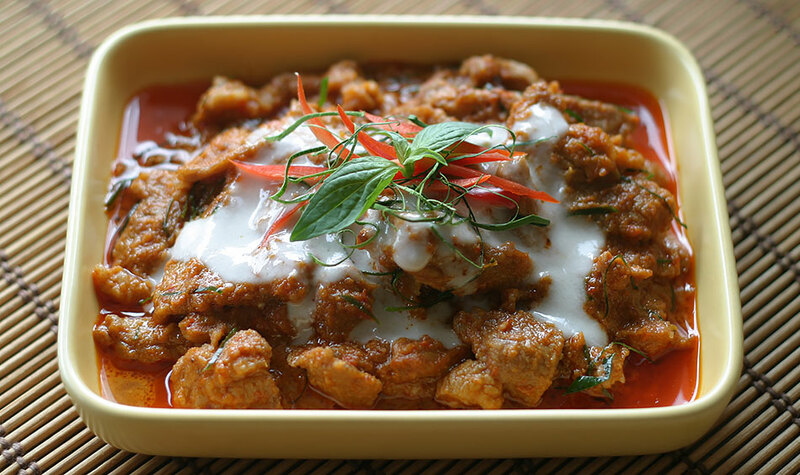 Hi – I have had two versions of Panang curry, both of which look the same but taste different. The first is your recipe, which while delicious, is fairly mild and muted in terms of flavour (I’m not talking about the amount of paste). The other version I’ve had has particular tangy/savoury taste which is irresistable. I’ve only found this more savoury version in one restaurant in Ottawa, and in only a couple of restaurants in Thailand. Due to language barriers (even at the one here in Ottawa), I can’t ask them what ingredient give it the tangy/savoury flavour. I’ve searched high and low for recipe variants, but to no avail. Do you have any ideas what this secret ingredient could be? Tamarind? Kepac Manis? Some kind of fruit/gourd? Is there a substitute for palm sugar? Believe it or not it’s the one thing I could not find. Amazon.com and type “Palm Sugar” in the search bar… you’ll find numerous offers, some in bulk and others in much smaller portions. If there’s an Asian market near you, ask if they have it or are willing to order it. They should have it. Prices are all over the place, so a bit of research should help you find if the high-priced stuff is worth the extra money. I just buy what my local Asian market carries and have no complaints about the generic stuff they carry. Please do not refer to Kaffir Lime leaves as merely “lime leaves”, as the Kaffir lime tree is a very specific fruiting tree for which there is no substitute for either it’s leaves or the rind of the fruit. While it is true that the unenlightened proponents of apartheid refer to people of color as kaffirs, it should not be an excuse to PC the name of a centuries old citrus tree out of existence. At least I presume that the Kaffir Lime is a true citrus. It’s all well and good to be sensitive to such things, but if the Kaffir is not specified in the leaf or rind/peel called for in the recipe, then it will NOT be the same, nor will it be as good. Thanks for allowing me to toss in my two-cents on the subject. I love the flavor! I made the veg version. But my ingredients are not all they way ground up. It was a paste but not completely. Is that normal? I used a stone mortar but could not get the galangal and other ingredients fine enough. Suggestions? Hi, I made this tonight and it was lovely! I used light coconut cream though and I didn’t get the oil coming to the top. would that be because I used light cream? Or maybe I just got it all wrong? Also, as the paste can take quite some time to break down, would you get a similar effect using a food processor? Delicious recipe, thanks a lot for posting. I was only able to find the smaller chilies (arbol) at my local Asian grocery and the dish did turn out a bit hotter than I had wanted. I’m having some trouble finding the long dried chilies around town, can you recommend a place to buy them online? Have you ever thought about including a little bit more than just your articles? I mean, what you say is fundamental and everything. But think about if you added some great pictures or videos to give your posts more, “pop”! Your content is excellent but with pics and videos, this website could definitely be one of the most beneficial in its niche. Excellent blog! Does this dish go well with glass noodles? I would recommend eating with rice. Why do you roast the seeds and peanuts separately? If each of them needs to be roasted about the same time, wouldn’t it be faster to roast them all together? What are the critical herbs/spices/vegetables ingredients for making Spicy Red, Green, Yellow and Penang curries? I understand all the Pastes for each color curry and the Fish sauce, Shrimp pastes, coconut milk and Thai chilies. I just need to know what else gives it that wonderful flavor? What goes into the paste is what gives it the flavor. Most curries have similar herbs and spices in the paste, but with different ratios. The color comes from the paste too. Red curry has many dried red chilies, green curry uses fresh green chilies, yellow has turmeric, etc. I love this recipe. I’ve made it 4 times in the past two weeks. I did add one ingredient, peanut butter. It makes this dish creamy and full of peanut flavor which goes very well with the spiciness of it. I got the idea from a Thai restaurant in Reston, VA.
Do you also have the recipe for “red curry paste”? They don’t give a recipe for “red curry paste”, though. First prepare curry paste. Place all ingredients except fish sauce in a mortar and pestle then pound until you have a smooth paste. Add 2 tbs. fish sauce, mix well and taste. You should have an even balance of hot, sweet, sour and salty. Adjust seasonings until this is achieved. Set aside.